ExpanDrive is a Sharepoint client that lets users securely map a drive to their Office 365 account. It integrates directly with your operating system, providing filesystem-level access to all remote files. This means you can browse, upload or edit Sharepoint directly from within Finder, Explorer, or any application on your machine. Simply put – Sharepoint shows up just like a shared drive. ExpanDrive accomplishes this mapping by securely connecting to Microsoft’s Graph API and translating the API into a filesystem for Mac and Windows. Authorization is fully handled by Microsoft. It fully integrates with your SSO setup and multi-factor authentication setups like Okta, Duo and Auth0 work seamlessly. 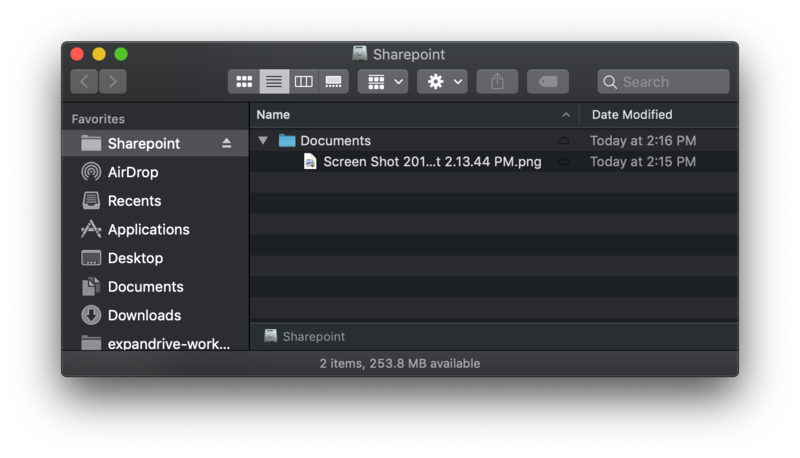 Microsoft provides a Sharepoint sync client for the Mac as well as for Windows. Native access to your files in the cloud is critical for any serious workflow. However, if you don’t want to eat up tons of disk space and bandwidth syncing files you rarely use it makes sense to map Sharepoint as a network drive. What good is unlimited storage your only supported mechanism move data is via sync. Using a sync client you generally have a folder on your machine that has a copy of all of your files pre-downloaded and it watches for chances. Unless your laptop has a 10TB hard drive you can’t fully sync your account. With drive based you access only what you need, when you need it. When you double click a file from Finder or Explorer it is transparently downloaded in the background. The same goes for any app on your machine, like Word, Excel, Photoshop – whatever. It builds Sharepoint support right into the operating system. ExpanDrive access files on demand, not taking up valuable hard drive space by pre-syncing your entire site or document library. Another nice feature of a Sharepoint client that connects via a mounted drive is that you can do things like map a specific Sharepoint subsite. This lets you turn a single document library that might be deeply nested into its own drive letter within Explorer or mounted volume in Finder. 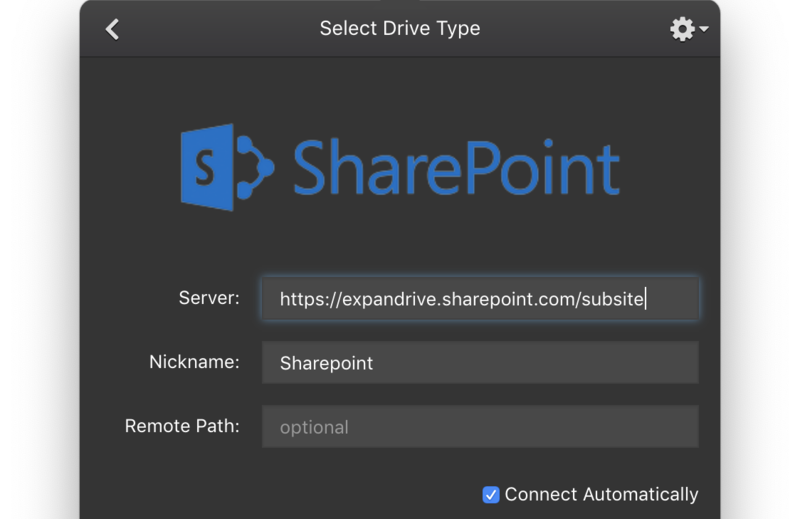 To get this going with ExpanDrive you first create a connect connection to Sharepoint, and after you have completed the authentication you want to modify the server field before you connect and save the drive so it matches the site you’re trying to map. In this case I am mounting the site named “subsite” on our Office 365 account. This should usually be a simple sitename, or is sometimes “/sites/subsite.” Check what the site URL via your web browser if you’re unsure. After you’ve hit the connect button can see that subsite Document library directly within Finder. If you want to map directly into the Document library, you can sent “/Documents” under the remote path setting. ExpanDrive lets you map your Sharepoint account as drive letter on Mac or Windows. You can browse and access your account without needing to first sync your files, which takes up time and space on your laptop. Just access what you need, when you need it, from within any app like Finder, Windows Explorer, Microsoft Word, Photoshop, or whatever you use. Everything is safely in the cloud but not taking up space on your computer. Isn’t that the point of cloud storage anyways?